Book thirteen of the Dresden Files series opens six months after our hero, Harry Dresden, sinks into the water after being shot through the heart while on his brother’s boat. He had just murdered the woman he loved, saved his daughter, and wiped out the entire vampire Red Court. In order to pull all of this off, Dresden was forced to call in every favor and pull every string that he had – good or evil. So, here we are in book thirteen, Ghost Story. Rest is not on the death agenda for Mr. Dresden. Instead he is shuffled into an “in between” where he meets his old friend Carmicheal – a man that worked with Murphy and was killed by werewolves – who greets Dresden and takes him to that big precinct in the sky… literally. Harry finds he has a choice. He can go back and wrap up the loose ends of his life; specifically, find out who murdered him. Or he can hang around in the “in between” and work with the other cops on various things like helping lost souls. Harry decides to find out who murdered him and goes back to Chicago as a ghost – without magic and without the ability to communicate directly. What he finds is chaos and pain. His decisions leading up to the assault and ultimately the destruction of the Red Court resulted in a power void that was quickly being filled by other unworldly terrors who were raging an all out war against humanity. His friends were all changed because of what happened – some grew stronger and some were losing themselves. The lesson Harry is faced with is the consequences of his actions. Something he had never really given much thought to in the past. We are again reminded of how powerful Harry was and the respect he commanded, even though he never seemed to realize it. 2) I absolutely hated the book previous to this one because Butcher chose to kill off my beloved Harry. It was very difficult for me to finally pick up this book and read it. I wanted to be able to read it with a clear, objective mind set. Folks, I did my best. I knew who had killed him the second he died in Book 12 – it wasn’t a surprise. There was no suspense there for any true fan of the series who knows the characters. What did surprise me is who ordered his death. When that was revealed, it was an “ah-ha” moment and suddenly a few puzzle pieces clicked into place. Butcher spends most of the novel having Harry run around peeking in on old friends – Murphy, Molly, Mort, Butters, etc. But, not a whole lot of time trying to figure out his murder. The whole epic battle at the end made no sense whatsoever and was just awkward and boring. It was frustrating how people that were intricate members of the entire series – like Murphy and Thomas – were not given the sort of focus they probably deserved in this novel which was supposed to read as a final farewell from the main character. There are the implications that a higher power has a vested interest in Dresden that never quite makes sense. And of course, we have the meddling Winter Court that just can’t seem to go away. Don’t get me wrong – this series would struggle without the fae element, but come on. Not even in Summer Knight were we able to pull together anything that made sense with this particular story line and here it gets even more annoying. There were a few shining stars in this book. 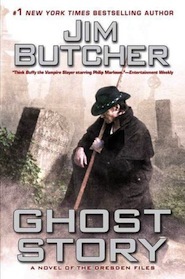 Butcher really had the tears flowing in the beginning of the book when we were meeting dead characters from books past. And he did a nice job of interlacing smaller story lines and characters from his short stories into this book. There are a few really good moments created on the pages of the book – without a doubt. Forcing Dresden to look at the impact that he had on his world and his friends also opened the door for the impact that his death had on people. It showed that the weak were strong because of his influence; and those that were strong, were weak because of his death. The consequences of his cowboy attitude on everything and everyone he held dear was made crystal clear and I think that moving forward, Dresden will be a better wizard because of it. I truly wanted to say good things about this book. But, I can’t. This whole life lesson could have been done as a condensed part to a longer novel. I think having your hero come back as a ghost is a clever idea, but it wasn’t executed well and just fell short for me. Butcher is a phenomenal writer and I would read a phone directory if he wrote it. But, I think some reigns need to be pulled and rather than juggling balls because they look cool, he needs to go back to the basics of this series. I don’t know what is going to grow out of this slash-and-burned storyline that we have after books 12 and 13, but I’m hopeful and confident. That being said, I’ve heard a rumor of a new book in the series coming out next year. I am keeping my eye on that and hoping beyond hope that it is a step back in the right direction to the good ‘ol Harry Dresden that I know and love.